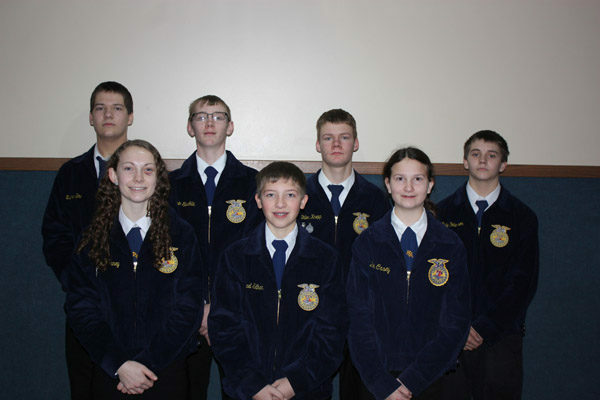 Centre FFA Chapter members attended the South Central District Speech Contest in Buhler, KS on Jan. 16. Seven members participated in different divisions of Prepared Public Speaking. Those in attendance included: Cailey Barney, Dillion Knepp, Kyle Peterson Tanner Stuchlik, Mikey Silhan, Quinten Bina, and Emily Casey. Dillon and Cailey participated in Sophomore Division. Cailey placed 10th individually, and Dillon placed 2nd individually. Kyle, Tanner, Mikey, Quinten, and Emily competed in the Freshman Division Kyle Peterson made finals and placed 5th individually. Also Kyle and Tanner competed in Creed Speaking. Members picked an agricultural related topic, researched, wrote the speech, committed it to memory, and then presented it to a group of judges. For the Freshmen Division they crafted a 2-4 minute speech, and the Sophomore Division length was a 3-5 minute speech. In Creed Speaking they have to memorize the FFA Creed and present it word for word with questions after the presentation. It was a very fun day and they really enjoyed the chance to get to give their speech.